International Falls is a small town in the northern side of the Minnesota state, located a few kilometers away from the Canada border. In the years before World War II, private pilots who wanted to land their single-engine planes in the vicinity of the town had a small grass runway south of Highway 11. After World War II, the City of International Falls formally established Falls International Airport at that airstrip site. The following year, in 1946, two paved runways were constructed, and a terminal building was added to the site in 1948. An extension of the original 3000-foot main runway was constructed in 1953, and marked the beginning of commercial air service. The airfield was first used as a launch site for stratospheric balloons between August and September 1955, during an expedition of the Holloman AFB balloon division, conducted under the auspices of the Aero Medical Field Laboratory. With the close cooperation of Winzen Research Inc. (main contractor and balloon supplier) were carried out a total of 10 flights carrying various loads, from mice and human skin samples to monkeys and emulsion plates with the common objective of to study the influence of the cosmic rays in living beings who were exposed to them for a long time. The Holloman staff provided the expedition with the land vehicles, a van for telemetry and communications, as well as a C-47 aircraft, all of them assigned to track the balloons while in flight and to recover the gondolas. The site was chosen because of its northern latitude because Earth's magnetic shield deflects less the incoming cosmic radiation allowing it to penetrate the atmosphere to levels much closer to the ground than in latitudes closer to the equator. These studies were of a very important nature for pionnering efforts to reach near space altitudes in manned programmes like "MANHIGH". After that series of launches, and during the remainder of the decade, there were only some isolated balloon missions launched there. 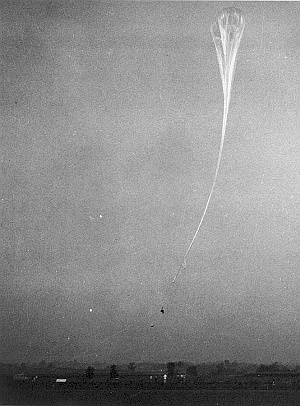 9/1/1955 5:50 CST + 4 d ANIMAL CAPSULE Failure of the separation system. Never recovered. 7/19/1958 6:57 cst --- ANIMAL CAPSULE (JIG I) No Flight. Balloon destroyed at launch.